Paul McCaffrey is a recognisable face as one of the jokers on Impractical Jokers, alongside Roisin Conaty, Joel Dommett and Marek Larwood. McCaffrey has supported some of the biggest names in comedy on tour, from Sean Lock to Rob Beckett, and now he brings his latest stand up show Suburban Legend at the Edinburgh Festival. He is performing his free show at the Laughing Horse at the Counting House throughout August. Certain restaurants and the rooftop hydro pool at the Sheraton hotel (I never used to be this much of a ponce, I’m sure I didn’t). It was about a man trying to stretch 20 minutes over an hour with varying degrees of success. It’s starting to. I was in a TV show a few years back (Impractical Jokers on BBC3) which some people really liked and I get a good few people that come from that. I’d say it’s fairly broad though, accessible to most people. Mice, last year. My regular Edinburgh flat mate, Matt Forde absolutely shat himself and had a sleepless night in the front room because he could hear them in his bedroom. Very funny. I’ve been on tour with Sean Lock this year, as a long time fan, that was pretty special. I always see Matt Forde, that’s kind of set in stone. I want to see Carl Donnelly on the Blundabus, for my money, one of the best in the business. To come back with a new set and to improve as an act is the main reason but I feel like I’m on good form at the moment so it would be good if I got some work from it too. Whatever is annoying me at that time, other people in the care home probably. Today marks one year since I first decided to start a blog about comedy. It’s unbelievable how quickly this first year has flown by and how many brilliant opportunities have come from that one decision last October and though I wouldn’t normally have thought to write a post of this nature, I am doing so because I am honestly quite shocked at how much I have managed to achieve in one year. When I first began writing about comedy on the internet, I could never have predicted that Moody Comedy would become such a big part of my life; one that I am proud of and eager to share with anyone and everyone. The past twelve months for me have involved seeing some incredible shows from Rob Beckett, Lloyd Griffith, Paul Foot, Tony Law, Joe Lycett, Sara Pascoe, John Robins and Bridget Christie as well as having a few more exciting potential trips planned for the near future. 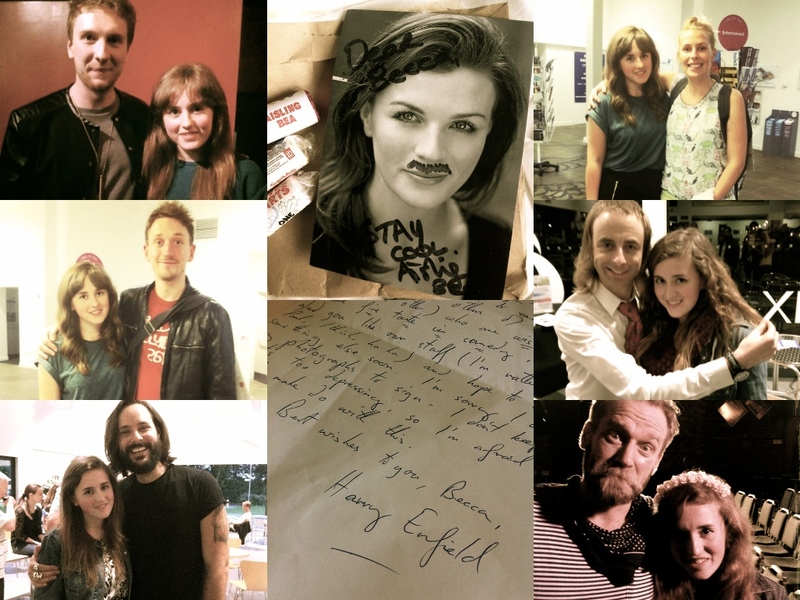 I have continued to collect autographs, most recently from Aisling Bea, Rhys Darby (of Flight of the Conchords), Richard Herring and a letter from the living legend that is Harry Enfield. The site has evolved from previous basic reviews and short chatty posts to develop an array of regular, and one-off, features including A Week in the Life, Comedian of the Month, Comedy Catch Up, Top 5 Moments, The Mighty Boosh Revisited, Garth Marenghi Revisited, and, most amazingly, my Seven Questions With feature which has allowed me to interview some fascinating people. One of the main reasons I set up this site was to be able to express to the creators of the comedy I love how much I admire and appreciate their work. This is why I am very active on Twitter and enjoy encouraging comedians, actors and writers to read what I have said about them and their shows. My favourite correspondences include comments from Graham Linehan, Bob Mortimer and Alan Davies as well as a retweet from the one and only Noel Fielding (which sent my stats into meltdown!). It has been an absolute pleasure maintaining and expanding Moody Comedy and I have been lucky enough to receive advice, encouragement and publicity from the lovely people at The British Comedy Guide and The Velvet Onion, especially Mark (founder and editor of The British Comedy Guide) and Paul Holmes (editor of The Velvet Onion). It has been brilliant to be able to gain insight into the professions of these interesting and successful people whilst learning the ropes myself. Considering this website is a purely a hobby of mine and that I am still only sixteen, having just completed my GCSEs and now starting my AS Levels, I’m going to do what I rarely allow myself to do: to tell the world that I have worked bloody hard and that I am proud of it. I also want to encourage anyone reading, regardless of age, to follow where your interests take you. The world is a busy place and it’s easy to get caught up in just keeping yourself running, rather than trying to achieve something new or something that requires more effort. With a little hard graft, your interests can become your hobbies or even your passions, and who wouldn’t want to do a little more of what they enjoy? Thank you all so very much for supporting Moody Comedy and myself; it has been a joy writing for you and I can’t wait to see where another year may take us.